- Oi shoppe, shoppe, dyavol si shoppe! - Oi shoppe, shoppe, umen si shoppe! oi shoppe, shoppe, shoppi ergenye. oi shoppe, shoppe, ovchi kalpatsi. oi shoppe, shoppe, beli krivatsi. oi shoppe, shoppe, svinski opintsi. oi, shoppe, shoppe, odat i okat. epa nema, nema, epa nema, nema. che ot Iskaro po-dlaboko nema. 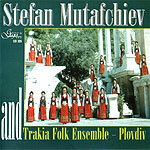 Тrack No:: 8 - Duration: 3'19"
The CD "Stefan Mutafchiev and Trakia Folk Ensemble - Plovdiv" includes 12 Bulgarian folk songs and music performed by Trakia Folk Ensemble - Plovdiv. The present album features one of Stefan Mutafciev's most beautiful works - Erkechki ritmi, Temen Gyuro, Praznichna suita, ect. Together with Sednalo e Gyore and Oi shope, shope, we can also listen to the not so well-known but still remarkable songs: 'Oi mori, kavale', 'Lele, Yano', 'Sedi moma', ect. They all form a rich collection, which is only a small part of the great art of the composer Stefan Mutafchiev.